My Mum has always made Christmas Cakes, for as long as I can remember. Despite the fact she doesn’t like them! I have memories of helping her making it, stirring in all the millions of ingredients. It was great fun. Mum never made it on Stirring Sunday, or whatever it is people call it. That is far too late to let the cake mature. She would make it in later September/early October sort of time. I’m not entirely sure why I decided to put this one on my list. As I don’t like Christmas Cake either! But I guess it’s just one of those things, so I can say, yes, I’ve made a Christmas Cake, and decorated it too. 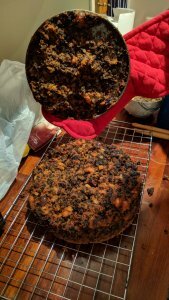 So, sometime towards the end of September/start of October my Mum sent me her recipe for Christmas Cake, and I started making it one night after Isla and Chris had gone to bed. I decided it would take quite a while to make, so just weighed out and mixed together all the dry ingredients. I then finished it off the next day while Isla was at nursery. I really struggled to know how long to cook it for, and to be honest, I’m not entirely convinced I cooked it for long enough! Next time, I must remember to line the tin though, as, despite greasing it lots, my cake got well and truly stuck! I scraped off the bits that got stuck, and plonked them on top of the cake. Good job it was getting covered in marzipan and icing to hide the mess! 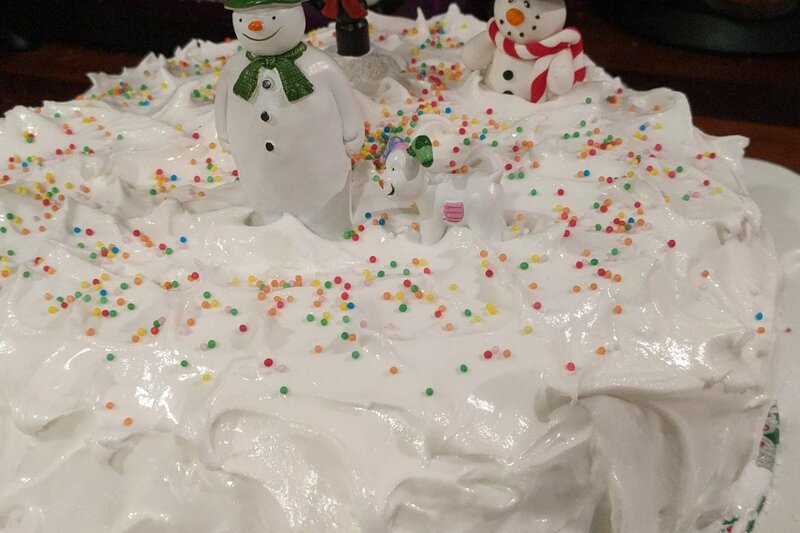 I probably fed the cake with brandy about 3 times between making it and decorating it the Sunday before Christmas. I may have been a bit too liberal with the brandy, but nevermind! 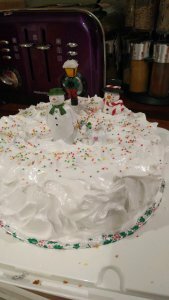 I had plans to decorate the cake on the Sunday before Christmas, so got all my bits and pieces out ready on Saturday night….read the instructions for the marzipan….turns out you need to do the marzipan at least 24 hours before you ice the cake. Oh well….16 hours will do! I don’t think I had quite enough marzipan, but I managed to stretch it, and patch it up well enough so that it was all covered. 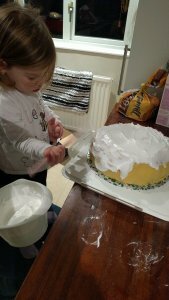 Isla decided she wanted to help me with the icing and decorating though, which I was mostly happy with. 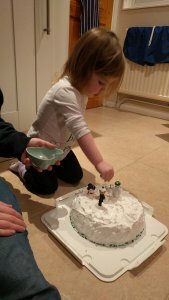 She helped to spread the royal icing on, but after a while deemed it “too hard” so I finished it off, and gave it a “snow” effect with the back of a teaspoon. We put on the decorations – the Snowman and Snow dog, another snowman, and a street lamp. Those 4 decorations and the cake board it’s on cost me a whopping £2.50 (maximum) in a cook shop closing down sale last July! Bargain! 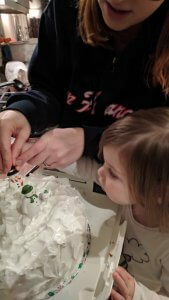 Isla also decided that the cake needed some sprinkles. 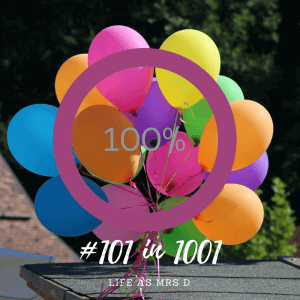 In her view, everything needs sprinkles! So we got out some hundreds and thousands and we sprinkled them on top…and actually I think it looked alright! Apparently I make a really good Christmas Cake, and the annual Christmas Cake making baton has now been handed over to me…Mum is now making Stollen instead! Turns out I’ll be making another Christmas Cake next year too then! So there we go, Make and Decorate a Christmas Cake has now been ticked off my list.